Does Drug Abuse Treatment Actually Work? If you are looking into treatment for drug abuse for yourself or a loved one, you may be wondering to yourself, “Yeah, but does that really work? Is it just a bunch of psycho-babble and gobbledy-gook that doesn’t actually do anyone any good?” We don’t blame you a bit if you’re skeptical of the results you can expect when you enroll in on-site drug or alcohol rehab. 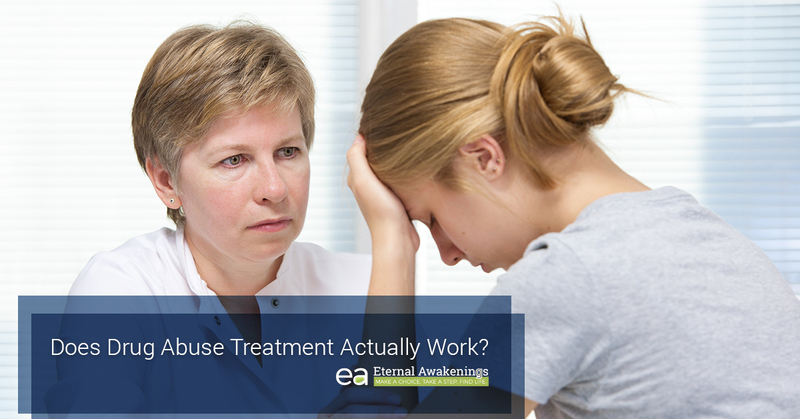 However, in our more than 20 years of experience, the staff at Eternal Awakenings has seen that it actually works. We are committed to not just offering treatment; we are after the outcome that our guests are searching for, and that is sustained recovery, even after they leave the program. Every program and approach is slightly different, so we can’t speak for the success of every method out there. However, here are some of the reasons why we can confidently tell you that on-site, Christian drug abuse treatment actually works. 1. It physically removes the addict from the substance. When you are addicted to something, chances are, you will continue to choose to use that substance, even if you’re convinced that it’s bad for you. Addiction is so powerful that successful recovery often depends on being able to stay for a certain period of time in an environment where your substance of choice is simply not available. Residential drug treatment creates just that environment and helps to get you through the critical initial period where you feel the worst and suffer the hardest cravings. 2. It works to resolve the issues that led you to turn to addiction in the first place. The first time you tried drugs or alcohol, you might not have had the conscious thought, “I am doing this because I have so much pain and trauma, I don’t know how to deal with it.” You might have just tried it on a whim, done it for fun, or done it to be cool. However, once you had experienced that high, you undoubtedly remembered how good it felt. Little by little, you might have discovered that every time you go through a painful experience, you turn to a substance to help you feel better. There’s no doubt that drugs and alcohol do work to alleviate suffering, temporarily dull the pain, and give you the chance to feel good, even if it’s just for a short time. The desire to feel good again is so strong that most people cannot resist it, and they will turn to that substance again and again. Being high is better than being in the real world. The real world, with all its pain and suffering and trauma, is dull and drab by comparison. The problem with this is that drugs are a fraudulent source of help. They rob from you more than they give. They tend to increase the frequency and intensity of the painful circumstances that you go through. When life deals you pain and suffering, there are other ways of handling those circumstances than simply dulling the pain with a substance. If you are burdened with a pile of painful life events, your rehab treatment can help you to work through those things in a healthy way and come to healing. Knowing how to do this will help you for the rest of your life for any future sadness, difficulty, and pain that you experience. 3. It helps to establish healthy patterns of living that you can continue moving forward. There are certain patterns and habits of healthy living that you might have let go of (or never established in the first place) in the course of your addiction. Building new patterns takes time; in fact, you used to hear that it takes 21 days to build a habit, but now the experts say that it actually takes 66 days to build a habit that lasts. When you’re trying to build a new habit, it’s common to plunge in with all the willpower, good intentions, and resolve that you can muster. Have you tried that, only to have all that willpower drain away after only a few days? Yep, us, too. Been there, done that. It’s frustrating and demoralizing to fail at building a new habit that you really wanted to be committed to, which is why you need support along the way. Here at Eternal Awakenings, we will work with you to gain true and lasting freedom from your addiction to drugs or alcohol. Contact us today to get started with the enrollment process. ©2017 Eternal Awakenings. Do Not Copy.